You don't need to give up on flaky pie crust when you are eliminating dairy from your diet. If butter is off the table, you can make pie dough with soy margarine and dairy-free cream cheese. This dough is great for making dairy-free recipes for classics like pumpkin pie. The advantage of using soy margarine (or another type of vegan margarine) is that it gives a flaky texture to the dough much like butter. Shortening or coconut oil could be used, but they result in a less-flaky crust. You will also discover that most people find it tastes just like a butter crust. Be sure to disclose it has soy if you are serving anyone who is sensitive to it. 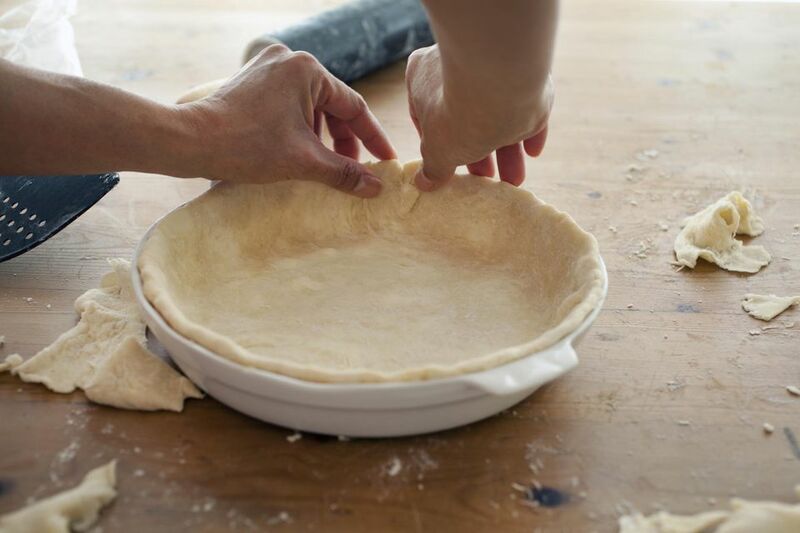 Although this dough can be made by hand with a pastry blender, it is best to use a food processor if you want to achieve the flakiest pie dough. When making pie and tart doughs, it is important to keep all of your ingredients as cold as possible and to handle the dough as little as possible. This recipe makes enough dough for one double-crust 9-inch pie or two single crust 9-inch pies. In a food processor, combine the flour, salt, and sugar. Add the soy margarine and dairy-free cream cheese and pulse until the mixture resembles fine crumbs. While the machine is still running, gradually add the water until the dough just holds together and pulls away from the sides of the bowl. Divide the dough in half, roll each into a ball and flatten the ball into a disk (this will make it easier to roll out later). Wrap each half in plastic and refrigerate them for at least 45 minutes before using, or up to overnight. The dough can also be frozen for later use. Wrap it well with plastic freezer wrap, aluminum foil, or place it in a freezer bag. Be sure to label the bag with the date that you froze it. For the best results, use it within three months. Thaw it in the refrigerator for a few hours when you wish to use it. When you are ready to use the dough, make sure everything that touches it is cold. Chill your rolling pin, cookie cutters, knives, and other utensils. If the dough starts warming up while you are rolling it out and shaping it, you can put it back in the refrigerator for a few minutes to chill it. With attention to these details, you should get the flaky crust you desire.